I think we should all celebrate our daily little achievements a little more. I mean, of course it amazing when somebody runs a marathon, or for an addict to cut out alcohol cold turkey. But it doesn’t have to be these big events that we acknowledge. 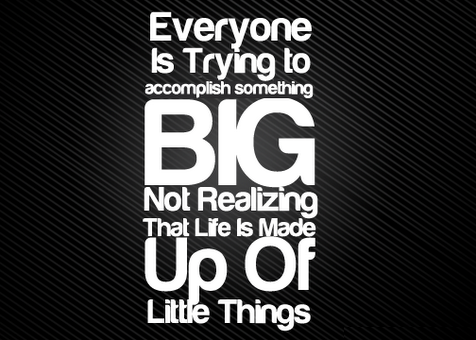 I like to think that I try hard to make a personal achievement every day, no mater how little. Because I don’t expect other people to understand, but when I walk past the chocolate aisle and don’t pick something up, to me, that’s a deal. Not a huge deal, but something that I’m proud of. Because I like chocolate, and when I’m trying to eat healthier, that’s a well done, for me, from me. When I run a mile further than my personal best- there’s better and faster runners- but for me, I’m buzzing! I’m sure (well, I hope) that other people do this too, and it’s not just me. But I think it’s a healthy thing to do. To have a daily target- something I want to achieve or get done- and do it. When I get home at the end of the day, knowing that I overcame my fear of calling somebody very important on the phone without messing my words up, or not letting myself get annoyed that ANOTHER old woman pushed in front of me in the bus queue, I feel good. Maybe it’s just for my personal gain, my own self-improvement, but I do feel better, as person, in myself, to know that I’ve done something to be proud of. I’m not naive to the fact that someone will always run faster, write better, be thinner. But doesn’t mean that I can’t challenge myself, regardless of what other people are doing. Coz I guess, at the end of the day, it’s just me who wants to improve me. And nobody can do this for me. Little changes really do make big differences, and one of the biggest changes I’ve had, is how I feel about myself as a person. I challenge you to find something you’ve achieved today. It probably won’t be big, and mean absolutely nothing to somebody else, but it might mean a lot to you. WELL DONE YOU! ← Thinspo vs Fitspo: the motivation of eating disorders?